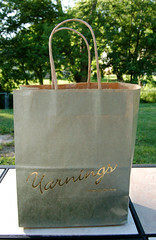 Decided to try and visit Yarnings today, since I'm feeling more into knitting and I love touching yarn. I went with a specific purpose in mind (sock yarn and, perhaps, Berroco Suede for Coachella. ), and left with two skeins of sock yarn, several magazines, and some size 0 DPNs. I was a bit disappointed because they did not have several skeins of Suede in the color I wanted, nor did they have Lorna's Laces yarn. 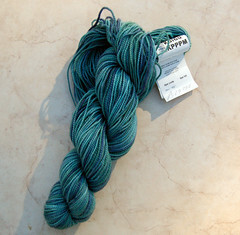 I also totally forgot that I wanted to buy some Debbie Bliss Cashmerino, which they did have! So, here's some of the purchases I did make. I bought some knitting magazines. They had older Vogues for two bucks a piece. Since I want to expand my pattern library and at least one of the ones I picked up had a pattern in my Ravelry queue, I was happy to pick them up. I also picked up a Rowan magazine on the mistaken belief that I'll ever knit anything from one of them. I swear that I become beguiled by Rowan yarn and their pictures and then the next thing I know, I'm purchasing magazines I don't need and will NEVER knit anything from. I did ALMOST buy some Rowan tweed since I love all tweedy yarns, but I hate to buy yarn without a specific project at least in mind. I fondled some Kollage yarn made of milk fibers that was called Creamy. I wasn't going to buy any (again, no project), then I remembered those adorable little baby booties that Sophy has been whipping up. Next thing you know, a small skein of the yarn is going to the front of the store, along with some bamboo size 0 DPNs. Why I'm buying the DPNs is beyond me since I've repeatedly said to myself that I'd prefer to either metal or Lantern Moon needles, but I buy them just in case I want to start knitting tonight! Lastly, because I can't resist sock yarn, I picked up a beautiful greenish-blue skein of Koigu's KPPPM which I know knits up beautifully. I didn't need it, but it will look cute with some of my wintry shoes. I was so happy that I came home and put everything into Ravelry almost immediately, and then I went and bought more sock yarn at Simply Socks Yarn online store for Helen's socks. Apparently, Blogger had to review this blog to make sure that I was not a spam site. I wonder what happened in my first post to trigger this fear? Anyway, I'm rushing along on my baby blanket. It is supposed to measure a good forty-six inches long, and I measured it today and found that I was already at 20 inches, which is nuts. I'm tempted to cast on for a nice soft hat now, but I must stay on target. The hat can be done after Kittle. The blanket must be finished prior to Kittle! Damn you, Ravelry, for having so many people posting non-baby projects that are just gorgeous. In other knitting news, I plan to hit some knitting stores in my area this upcoming week, and I want to buy some yarn for Helen's socks as well as buy some yarn for socks for the baby and myself. Perhaps I'll buy some knitting magazines as well. I'm a multiple time failed blogger, but the only time that I was even remotely successful was when I was blogging about knitting. So, why did I stop last time? After years of some interesting projects such as three baby blankets, three tops, and about fifteen pairs of socks, I decided I would knit my husband a Harry Potter scarf and do NOTHING ELSE. I eventually stopped knitting. I stopped blogging. I started to draw and cross-stitch and do other artsy things. Mostly I just sat on the internet. After a bit of light prompting on my husband's part, I finally finished the scarf, and I was pretty proud of it, but reluctant to move to anything else. Then, two of my good friends decided they were going to have a child, so I started knitting them a baby blanket. As anyone who has ever knit a blanket knows, it can take a good long while, so I hunkered down on that. By this time, I was almost over knitting. Then, I found out I was going to have a baby! I knew I had to knit just a few things for my own baby, including its own blanket and hat, and maybe a small wee sweater or socks. I finished the baby blanket for my friends Paula and Tom and ordered the yarn for a hat for my own baby. I told my boss, Helen, that I'd teach her how to knit, and I gave her one of my knitting books and some beautiful Cascade Pastaza yarn and some nice bamboo needles. Bad luck struck at this point for me, I got a blood clot, and a nasty one and ended up in the hospital for several days. Bored, angry, tired of playing Tetris on the DS, I told Paul to bring me the yarn for a second sock I had never finished as well as my needles. Over a year earlier, I had made the first sock in a ribbing that I ended up hating beyond all belief, and I had refused to start a second sock pair without finishing this pair. The small, light project was the perfect thing for laying around drugged up in a hospital bed. I finished the second sock in two or three days. By the time I got home, I was in fine knitting form. My yarn had come for my baby's hat and it turns out my knitting magazines were easy light reading for the bathtub (where I spent most of my time), and knitting was a nice activity to do as it allowed for me to fall asleep into a drugged haze easily. I could knit in bed or on the couch. Since I could read my stitches easily, I never got lost on where I was. By the time I had finished my baby's hat (or nearly finished it depending on my baby's eventual gender), I had ordered the basic yarn for my baby's blanket and started knitting that. By this time, I had gone back to work (while on blood thinners) and found out about something called Ravelry. I applied to join Ravelry and forgot about it. Then Bryan sent me a link to his friend Sophie's Knitting Blog where she had beautiful work, and the next thing you know, I was writing to her about her blog and listening to her discuss Ravelry. I joined Ravelry a few days later, and then rapidly became OBSESSED with it. If you see this and you want to see my projects, I'm Septy on there.